I already have an external 8 to 1. I dont think I need more purchase (I grunt a lot) just I like the clean look of the internal system. But Ive never worked out how people attach those top blocks. Tape the plate to a long stiff rod or beam. Broomstick worked well for me. 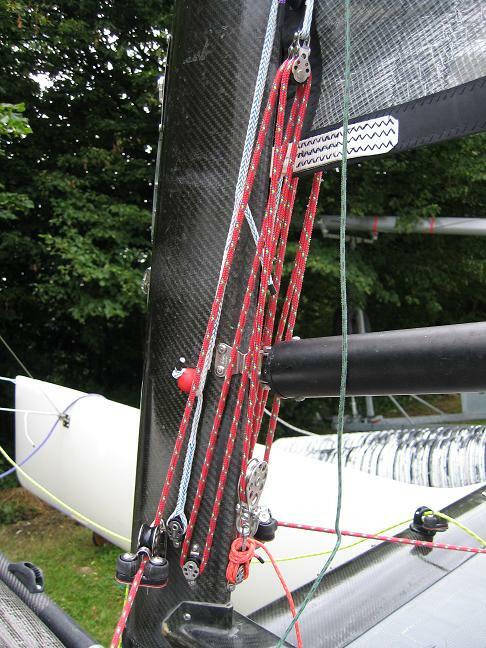 Don't go overboard with tape it, you are not forcing up the mast. Fiddle about with the broom stick while your helper looks through the whole in the mast to see whether one hole is about to aling itself. If so, use a iceprick of screwdriver to "stabilize" the plate. Increase screwdriver size as to align the plate better and better. Keep the screwdriver in and try to aling an opposing hole. Use again some screwdriver to properly align the plate. The plate should be aligned pretty well know, try to put blind rivets in the remaining two holes. With a bit of fiddle this works. If confident you can pull the broom free before doing this. From then onwards replace screw drivers with rivets. Certain everything is alright ? Rivet all fasteners into place. I think it took me 5 minutes do do, but I had the whole system neatly lined up next to the mast. It is really not as difficult as it sounds. 8:1 will do but 12:1 is better with respect to finetuning the luff tension. Last edited by Wouter; 11/20/09 07:05 PM. We employ the same system on the cap, the snag is the two floating blocks running along the main beam hitting each other as they pass by, only happens at a certain point and not all the time. I have spent many sleepless nights trying to work out something better.. there must be a better way. It looks like you've replaced the micro cheek blk at the very base of the mast aft, with something larger, what prompted that? What is that blk, I don't recognize it? A wire blk? How about the red twing ball in the blue line, is that your way of terminating the blue line after it's been fed thru the blk(s) at the mainsail tack? Nice! Is the red line 3/16"? Which line(Mfgr)? Thanks for the pic and post! Micro cheek block is still there; the wire block (as you guess) is just tied to it; I wanted a larger dia block as at times the rope was rubbing on the gooseneck when I had lots of DH on. Not sure who made the red rope; it's just what the chandler had at the time; I THINK it's 5mm; this setup is very efficient, I never really need to pull it hard; it just comes in when needed and because it's a cascade with fairly big blocks it runs out very well too. The red ball, is, as you guess the termination of the line that goes thru the block on the sail. I have a bit of D12 with the ball on spliced onto the forward block; the D12 that goes thru the block on the sail has a spliced loop just big enough to get the ball thru once pulled snug thru the block on the sail. Last edited by scooby_simon; 11/21/09 04:33 PM. 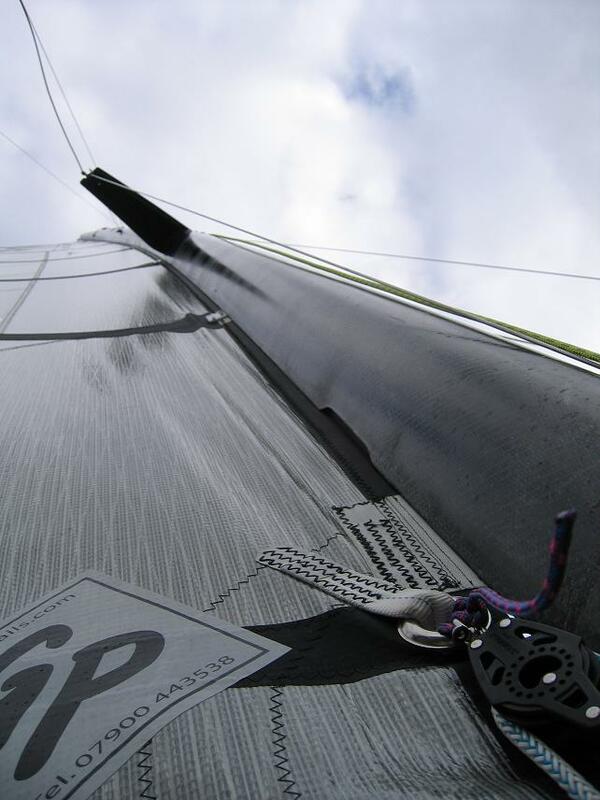 What blks are you using at the mainsail tack, and how are they attached? Thanks! Bit of Spectra line goes thru the sail and back a few times and another block on the other side; not very high tec but it works! Shed loads of downhaul on in that pic, all with one hand and not working very hard! Last edited by scooby_simon; 11/22/09 03:52 AM. Is around 50Kg a value that could be expected as mainsheet force, is this a typical value for a "normal" adult man? or would it tend to be high? or low? (I am asking as I had a question from my sailmaker on how much forestay tension I would expect). 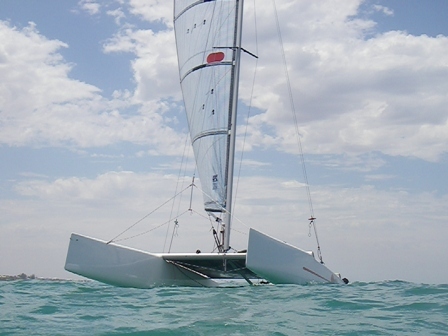 I am putting a tornado rig on a monohull, boom 2,4m, 1:10 purchase, forestay same distance away from mastbase. question is what the contribution from the mainsheet would be on the forestay? Input greatly appreciated as I ordered a sail yesterday and need to give some input in order for the sailmaker to possibly adjust for forestay sag compared to a non-rotating mast setup wich could have higher sidestay tension. What is your stability like compared to a Tornado? It is not only how hard you crank on the mainsheet but also the stability curve of the boat. Less stability = less mainsheet tension. You probably want to look at similar boats to see what purchase they go with. 50kgs is a load you could pull from the trapeze with good footing. I never measured though. The stability factor from the boat will be limited, the righting moment will mainly come from 2 crew in trapeze. Racks extending ca 2,5 from the boats centerline. The boat is intended to be sailed "completely" flat. The keel weight will be to balance the mast but not much more. This together with sail area means it will be fully powered up earlier than a T, but later than an A-cat. (if my calcs are correct). From actual land based experiments 50kgs is really a bit of a struggle one handed and needs leg drive as well. A straight pull one handed of 45 kgs took the skin off my hands so unless you are super athletic and can lock your feet into to something then 50kgs is going to be your upper max. An old thread but a good one. I like looking through these old setup threads. I am keen to try Wouter's 1:12 internal system on my Cobra. I miss Wouter. One thing I wonder about internal downhaul systems is how to prevent problems that could come up if the system loses tension in a capsize, whilst on the road, etc. What are the tips for avoiding any problems? Never had any issues with the internal system on my Blade or Falcon and I travel a lot (I try to minimize the capzised though :-) ). Since 2 years we are using the nicest system from a usage point of view on the Falcon I find. There is an external 1/16 downhaul as you can find on many F18's, but it comes with spinlocks and is easy to remove from the mast (meaning you can splice it in the front beam). Compared to most other cunningsystems this one is always easy to cleat or uncleat (even with high tension on it) and does not undo itself when taking it out on your trapeze! I can post some pics if you like. You can find how it looks in the beam. This is a picture showing the setup. The blue line is the cunningham. You just have to remove the spinlocks and 2 shackles and the system is fully loose. The spinlocks prevent the line from uncleating when getting in the trapeze. The orange line is the mast rotation quick release. Last edited by Gilo; 09/29/15 12:42 PM.